JS matters because it&apos;s the fabric of the web, and increasingly used in server side apps with Node, and in mobile and desktop apps with Cordova, React Native, and Electron. So it matters that we push it forward. Languages which don&apos;t evolve start to die. Improving the language means we can improve our code. Our apps can have fewer bugs. And some of these features enable the runtimes to actually run code faster. So let&apos;s dive in, starting with variables. The variable is only used inside the loop, but I can still reference it outside. This is just tons of bugs waiting to happen. The good news is we don&apos;t have to use var anymore. Instead we can use const and let. The new keyword const does exactly what the name suggests. It makes a real constant. If you try to set the constant you&apos;ll get a runtime error. Even better, code linting systems can detect this kind of bug at compile time now, so you can find bugs earlier at development time rather than in production. The other new kind of variable is created with the let keyword. let is just like var but it is scoped by block instead of function. Now it does what we expect. Now the i variable is restricted to the body of the for loop. There is no way it can be used outside accidentally. Also, let isn&apos;t hoisted, so all of those magic moving variables go away. The new keywords const and let are a complete replacement for var. With modern browsers and the newest versions of Node, there is no reason to use var anymore. Good riddance. ES6 introduces a new type of string called Template Literals. I prefer to call them Super Strings. You use a super string just like a regular string, but instead of using single or double quotes, you use the back quote. So far so good, but nothing is very different. It does have one immediate advantage. If you need to use double or single quotes inside of a string you don&apos;t have to escape them anymore. However, super strings have a few other tricks up their sleeves. Finally we can have real multi-line strings. Need to quote several lines of something? You don&apos;t have to escape newlines or do join tricks anymore. Just put in the newlines directly and it works. var qq = "this is a very long"
+ " piece of text that goes over several lines"
Combining expression escaping with multiline support gives us great HTML templates. So that was strings and variables, but now let&apos;s take a look at functions. If you&apos;ve heard anything about ES6 before, it was probably about arrow functions. These are a different syntax to write regular functions but with a more compact syntax. They also have one very important difference: the this variable means something different. Let&apos;s look at some code. Suppose you want to loop over an array to double the values within it, producing a new array. You could do it with the following for loop, but that creates extra variables and it can be easy to accidentially break early or get the index wrong. plus it&apos;s a lot of extra typing. Woah! That&apos;s a lot smaller. Let me explain what happened. An arrow function lets you rewrite a function without the actual function word. Instead you put the => after the parenthesis containing the function parameters. Arrow functions let us write the same thing smaller. But we can make it event shorter. Let&apos;s remove the whitespace. Same code just shorter. But we can make it even shorter still. If the arrow function contains only a single expression, we can remove the return and the braces and semicolon, resulting in a tiny one line expression which automatically returns it&apos;s value. This is so much cleaner. Arrow functions can make your code very compact and powerful. But there&apos;s one more trick up it&apos;s sleeve. It fixes this. When you are using other objects the this context may be different than what you expect. When you pass a function to somewhere else to be called back, it may call the function with a different &apos;this&apos;. If you add an event handler to a button the button will be the &apos;this&apos;. Sometimes that&apos;s what you want, but in the code above it isn&apos;t. We want this to be the surrounding App object, not the button. Another way to solve the problem is to bind the function. The bind method forces the this to be a specific object, regardless of how the function is latter called. Again, this will work but it&apos;s not great. We now have extra code to write, and underneath doing a bind can create extra overhead. Arrow functions give us a better way to do it. Arrow functions automatically capture the this var from the surrounding context of where the function is defined, not from where the function is used. This means you can pass the function to some other place and absolutely know that right version of this will be used. In the code above everything works perfectly without any yucky hacks. In short, arrow functions are really awesome. I try to use them everywhere I can. They make your code shorter, easier to read, and this becomes sensible again. For example, in Node you might want to load a file, parse it, make a database request, then write a new file. These must all be done in order, but they are all asynchronous so you have to start nesting your callbacks. This produces what JS hackers like to call The Pyramid of Doom. You get massively nested code. This code is ugly, hard to reason about, and has lots of nasty corners for bugs to hide. Promises help us defeat the pyramid of doom. Promises with then callbacks are much like traditional callbacks, but promises add an extra twist: they can be chained. Let&apos;s revisit our code from before. Each of the functions must be called in order, and each depends on the result of the previous one. Using promises we can do it like this instead. Notice how the arrow functions make this nice and clean. Each then() callback returns a value. This value is passed to the next one so all of our functions can be easily chained. Now you&apos;ll notice that the processFile command needs the result of the previous two values however a promise only passes one value. We also don&apos;t care what order readFile and fetchNames happens in. We just want to know when both are completed. Promise can do this too. Suppose want to load each file from an array of filenames and be be notified when they are all done. We can do that with Promise.all(). all is a utility method on Promise which takes an array of promises and returns a new promise that resolves when all of the sub-promises complete. Here&apos;s how we would load all of the files with Promise.all. (assume that readFile is a function which returns a promise to read the file). I&apos;ve combined the read file and database calls into a single promise using Promise.all. The value it will return is an array containing the results of both sub-promises, so I can then put them into processFile. Notice that I&apos;ve also used the abbreviated arrow syntax to make the code smaller and cleaner. Now consider what happens if one of these Promises fails? To handle the first one failing we could put in a try / catch block, but the next then will still be called. Really we want everything to stop if the first one fails. Promises have another trick up their sleeves: the catch callback. In the new version below if anything fails it will immediately jump to the catch callback at the end, skipping the rest. After the catch we can still add more then clauses. Of course promises only work if the APIs we call actually use them. Lots of libraries are starting to switch over to promises, but while we wait we can make our own promises too. We do it with the Promise constructor. It takes two values: resolve and reject. Each of these are callback functions. Inside you do whatever you need to do that takes a long time, even if it involves multiple callbacks. When you are completely done invoke resolve() with the final value. This will then be sent the to the first then clause of whatever uses your promise. If something bad happens and you want to reject the value, instead of throwing an error use the reject(), passing whatever alternate value you want. Here&apos;s a real-life example. I use AJAX calls all the time but they can be ugly, like this. Let&apos;s wrap this code up in a promise. This is still the same basic code, but I can call it like this instead. Wow, that&apos;s so much cleaner. In reality I don&apos;t need make my own AJAX Promise wrapper because there is a new web standard called Fetch which already does this for me. Fetch isn&apos;t quite supported in all browsers yet, so we can use our own until then. Promises can be a bit tricky to wrap your head around at first, but once you start using them I think you&apos;ll really like them. They make it very easy to pull multiple functions together into a single workflow that makes logical sense, and to properly catch all errors along the way. Finally I want to show you a bunch of new Array features. 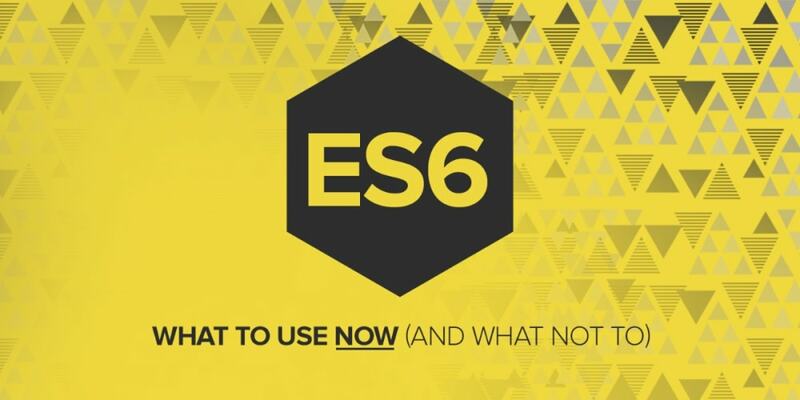 Most of these aren&apos;t exactly new for ES6, and in fact some of them are quite old. However, they are finally supported everywhere and play nicelly with Arrow Functions and Promises, so I think of them as new. Suppose you want to do something to every element of an array. Instead of using a for loop, use the forEach or map functions. The forEach function runs the callback on every element of the array. The map function also runs on each element, but it stores the results of each callback into a new array. If you want to transform an array by including only certain values, use the filter function. Array also has functions to find single values within the array based on some criteria. Destructuring allows you to pull values out of an object by name. It can be useful in a few situations, but the best use I&apos;ve found is extracting functions from modules. Unfortunately modules are still a mess and don&apos;t work the same everywhere, so avoid them for now. Along with destructuring you can do without tricks like default parameters, and the spread operator. I find these to be more trouble than they are worth, at least for now. Symbols, generators, iterators, weak maps and sets, and proxies are genuinely useful but they aren&apos;t supported everywhere yet so I suggest you wait a while before using them. Most desktop and mobile browsers support everything I&apos;ve shown you. However, depending on your audience you may have older browsers / older mobile OSes that don’t. Whenever you want to know if something is ready, go to caniuse.com. It will tell you what versions of each browser support what. We&apos;ve created a catalog of example code that uses Arrow Functions and Promises to communicate with lots of useful realtime webservices like on-the-fly language translation, geo-coding, and chatbot apis. O’Reilly author, developer advocate, and recovering engineer. I'm the technical marketing manager at PubNub. Previously I worked as a developer evangelist at Nokia, Palm, and Sun. I'm passionate about user interfaces and education, and I live in sunny Eugene, Oregon.